While Splash Mountain is being refurnished (an annual event), its 8-die machine has been relocated to the Briar Patch gift shop. The CTM Group map shows its original location and its new location, but there is only one machine. Splash will reopen in mid-November. This entry was posted in Florida, Magic Kingdom, Uncategorized on October 13, 2017 by jnmcnally. Another 8-die zinc-dispensing machine has been added – this time at the Tomorrowland Power & Light store adjacent to Space Mountain. 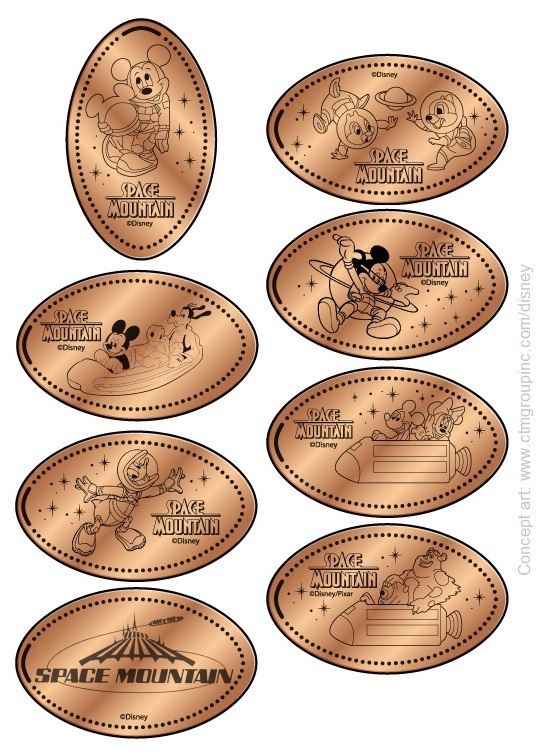 All 8 coins have space or Space Mountain themes and bear the attraction’s name. The machine is toward the back of the store and replaces the 3-die quarter press. That machine may be retired, or it may make a comeback. This entry was posted in Florida, Magic Kingdom, New machines, Retired/removed on August 29, 2017 by jnmcnally. On June 6, 2017, a new 8-die machine as installed in Mickey’s Star Traders at the Magic Kingdom. As with the other 8-die machines, this one dispenses its own shiny (or, as they say on the internet, “shinny”) zinc pennies. I have sets available in my Ebay listings, and they will be added to my website later today. This entry was posted in Florida, Magic Kingdom, New machines on June 9, 2017 by jnmcnally. I like to catalog the differences between coins, using the Presscoins numbering system. I will chronicle my findings here if they are not already on the Presscoins website. 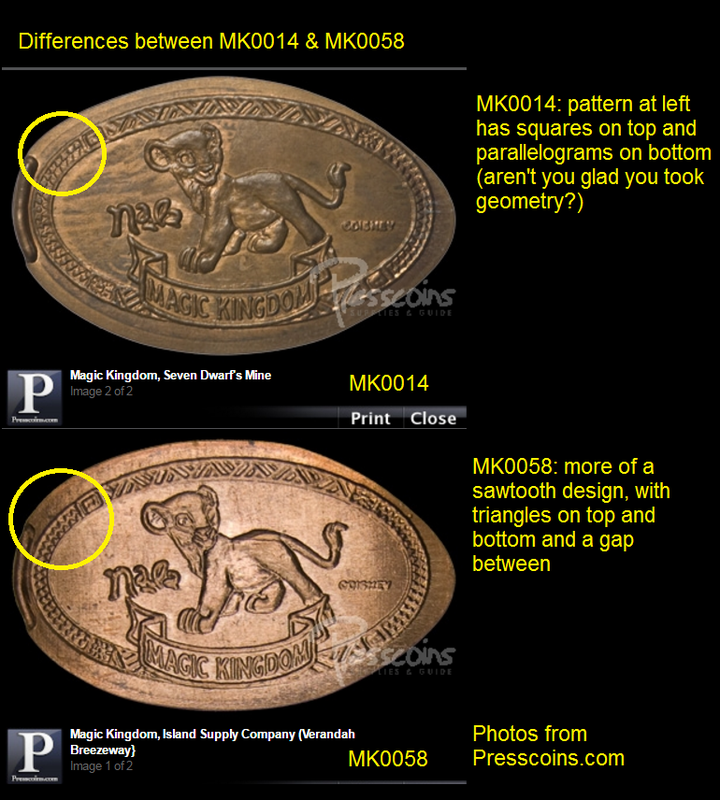 Here, I compare the Nala pennies from the Magic Kingdom using Presscoins.com’s photos. MK0014, retired from the Seven Dwarfs Mine shop, uses squares and parallelograms in the upper left ring pattern. MK0058, from the Zanzibar/Island Supply shop in Adventureland, has a sawtooth pattern with triangles and a gap between. This entry was posted in Florida, Magic Kingdom on May 28, 2017 by jnmcnally. There are a lot of updates this month, so I’ll just rattle them off quickly. The 2017 coins have been in place since the first week, but machines have been out of order so it is difficult to build complete sets. During my visit, three machines (out of 15 with dated designs) were broken. 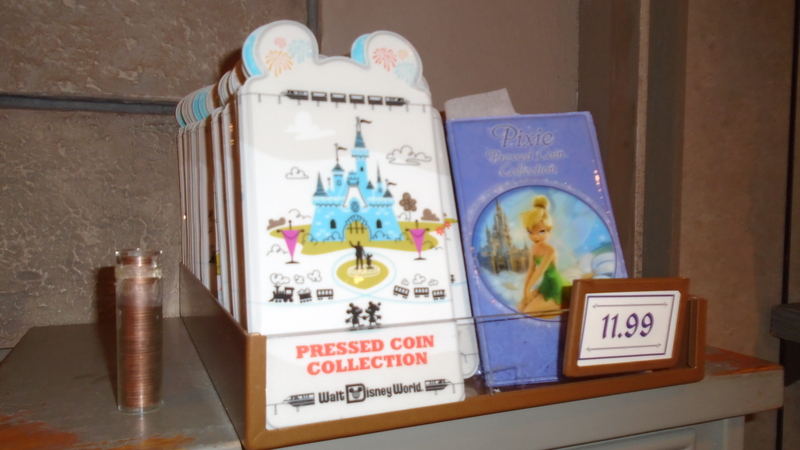 A new 4-die machine was installed at the walkway outside the World of Disney Store with new designs. They are available for sale on my website. The two machines at Verandah Breezeway connecting Frontierland with Adventureland were removed in December. The Adventureland designs came back in January. The change machine also returned. The Island Supply machine with Lion King designs did not return. There are no longer change machines at the Tomorrowland Power & Light location; the arcade has closed. The penny, dime and quarter machines are still there. The 8-die Toy Story machine in Tomorrowland is located inside the photo pickup area of the Buzz Lightyear ride. The 4-die machine at the Buzz Lightyear kiosk has returned. Innoventions once again has machines in both the East and West buildings. The official maps don’t show this, but the 4-die Rock ‘N’ Roller Coaster machine in the courtyard is still at that location. The Tower of Terror courtyard machine (4 dies) continues to roll short for copper pennies. One contributor to my Facebook page reports that he had better luck with zinc coins. Although Pizza Planet once housed numerous penny presses, its replacement PizzeRizzo has none. The Celebrity 5 & 10 machine is inaccessible during renovations of the neighboring photo shop. The price of penny books has gone up to $11.99. The new design and the Tinkerbell design are both available at most locations. The two Wreck-It Ralph machines have been moved from inside Disney Quest to the store. The machine outside Pioneer Hall at Fort Wilderness was not found on my mid-January visit, and cast members did not know what happened to it. This entry was posted in Books & accessories, Disney Springs (Downtown Disney), Epcot, Florida, Hollywood Studios, Magic Kingdom, New machines, Resorts/Hotels, Retired/removed, Theme Sets & Year Sets on January 27, 2017 by jnmcnally.